In National Gardening Week, the UK celebrates gardens and all of the benefits they bring to our wellbeing, our environment, our wildlife and our economy. But IS gardening truly sustainable? These days, almost everything you find in the garden centre could potentially have been imported. I say potentially – not everything is, for some nurseries are quite fussy about sourcing goods locally. Bigger carbon footprint – goods have travelled a lot further by road, rail, boat, plane etc and that means more fossil fuels have been burnt to get them into store. Fewer employment opportunities – most of the work will have been done in other countries. That’s not just the growing and harvesting jobs either, it’s the engineering work to build hothouses, irrigation systems, machinery and packaging. It’s also the lorry drivers who will collect the goods from the point of manufacture and deliver them to the point of sale. Less control over the use of pesticides and chemicals – depending where things are being sourced. Exploitation of workers – again, depending where the goods are sourced. It’s a sad fact though, that for many garden products, it’s actually cheaper to source them from overseas growers and manufacturers than it is to buy home grown. Garden retailers need to make a living, and if their prices are higher than their competitors, they will quickly lose trade. So, naturally, they trade with the lowest price supplier. However, the trend is shifting a little. More and more I see “British Grown” or “Local Grown” being promoted as a selling point and that, to me, is a joy. Given a choice I will always buy British. Whether I am in the Supermarket, the Farmers market, the Garden Centre or online. Why do I buy British? Because I believe that it is the more sustainable choice. At Harrowden Farms, everything possible is done to make sure that all of our products have the least possible negative impact on the environment. Our turf production farms are environmentally aware and have plenty of measures put in place to protect and nurture wildlife. Hedges, ditches, woodland, road verges and field margins are all carefully managed to create wildlife corridors and habitat. We install bird and bat boxes and are proud of our wild visitors. Chemical use is kept to the absolute minimum. 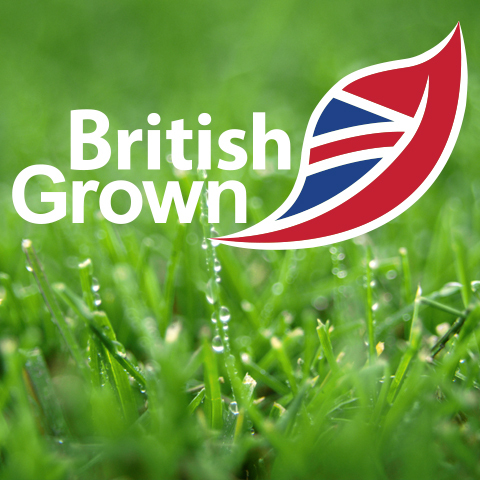 Careful choices of grass cultivar and a mowing regime that puts the least possible stress on the crops all mean that pests, diseases and weeds are not too much of a problem for us. We employ local people and contribute to community life with sponsorships and by buying things like office supplies, packaging, farm machinery and maintenance services from nearby outlets and dealers. New products are designed and developed with biodiversity and sustainability in mind. Our Enviromat and Meadowmat products are specifically targeted at the construction industry where biodiversity can be a bit of a mystery to architects and developers. Our CPD talks help specifiers to gain a greater understanding of the value of plants and what is involved in sustainable planting. Haulage is probably the biggest threat to the environment in our business. We DID buy environmentally-friendly blue-motion cars for our sales reps… the intention was good but we were among the many who were duped by a certain manufacturer. Delivery lorries are scheduled on a daily basis so that their trips are as short and as fuel-efficient as possible. Unfortunately, that means that not every customer can have their turf, soil, Meadowmat or Enviromat delivered first thing in the morning. Every shiny thing has a shadow. Next time you’re sourcing supplies for a landscaping project, please spare sustainability a thought. It’s not about short term savings – it’s about making sure that we leave the planet in good condition for the next generation – and the one after that – and the one after that.